Of all this things we’ve grown, I think I’m most excited about the pineapples. I’m not really sure why but I am. We planted a couple of tops in the spring of 2011 and a couple more last spring and summer. 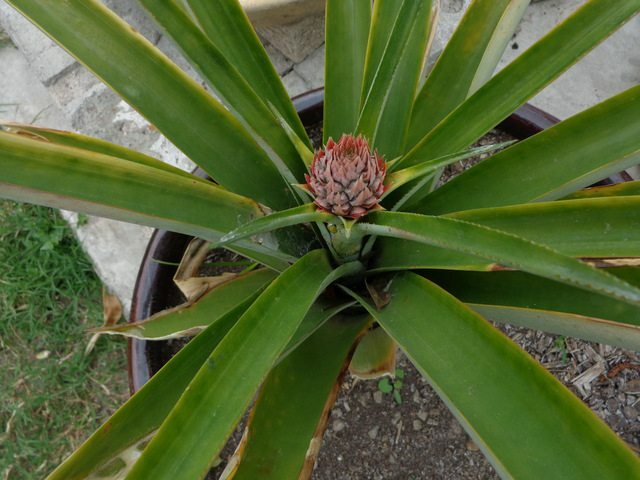 One of the ones we planted in 2011 is making a pineapple. So now I’m planting every pineapple top I can get my hands on in the ground by the peach and plum trees. This photo is from August 2011. About 4 months after I planted the pineapple top. This is the same plant in April 2013. Not a lot is written about growing pineapples, I suspect because most people don’t live in a climate where they can grow them easily outside. But they can be grown in a 10-12″ pot. 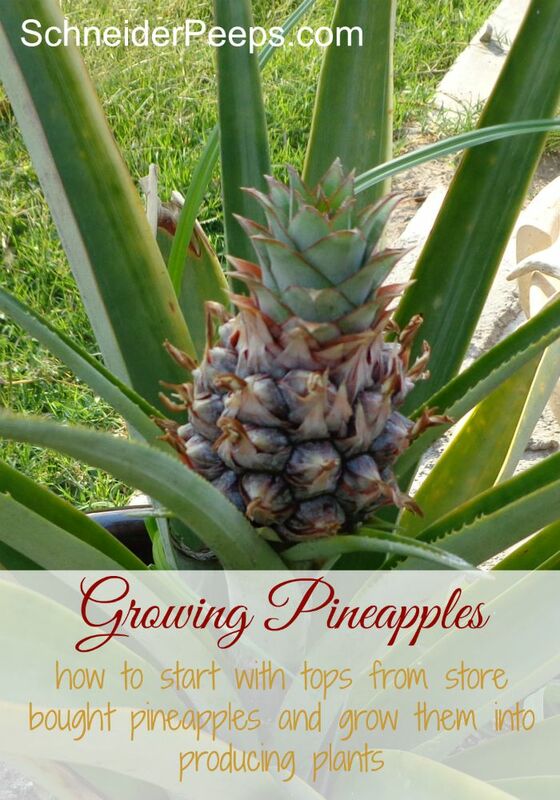 You can plant the top of a store bought pineapple. Just leave a little of the flesh on, let it dry out for a day or so and then plant in well drained soil. You can also purchase a pineapple plant from a nursery. Some recommend that you leave the pineapple top in water for about a week. The times I did this, it rotted – so I don’t recommend that, but it’s your plant do what you want. Minimum temperature is 60 degrees. Now, we’ve gone way below 60 here during the winter and I only covered them when we were actually going to freeze. So I’m guessing a little cooler is ok as long as most days aren’t below 60. 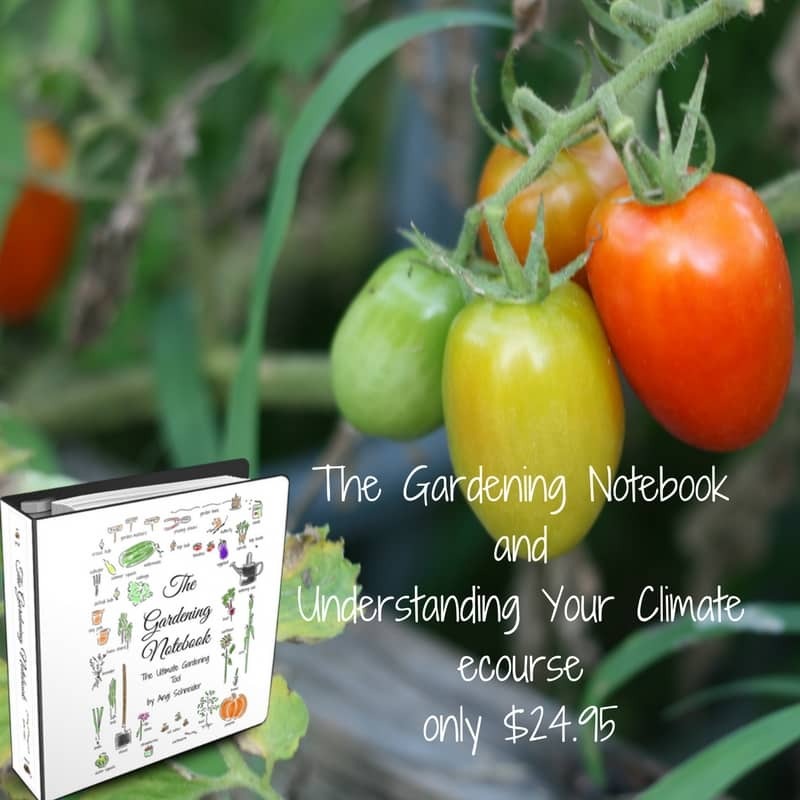 Maximum temperature is 90 degrees according to Grow Fruit by Alan Buckingham. Most of our summer is above 90 degrees so I don’t really know what to say other than apparently this isn’t a hard and fast rule. I’ve heard that you can put an apple slice down into the pineapple plant to help stimulate production. I’m going to try that on the one from 2011 that isn’t producing. Chickens will eat the unripe pineapple – so guard it if you have chickens. 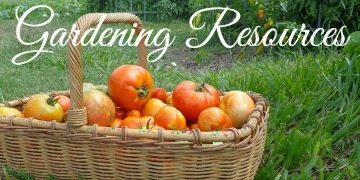 What fun things are you growing in your garden? 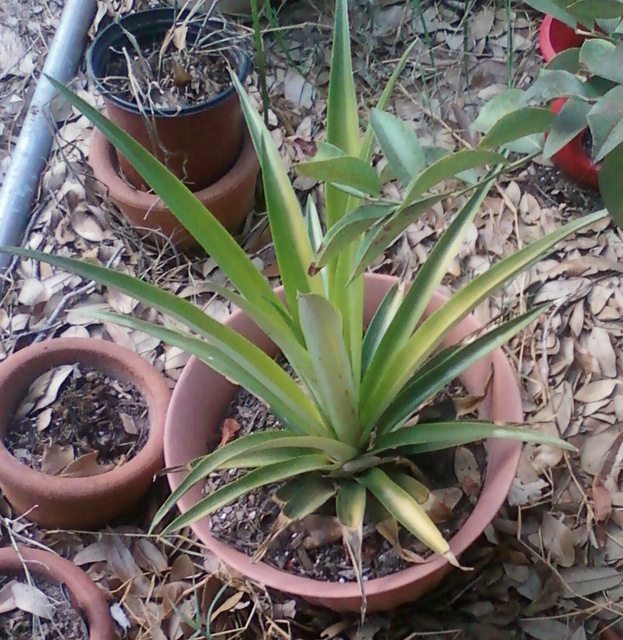 I would have four pineapple plants in pots, but my dog tends to enjoy pulling them up out of the soil. I had one in my kitchen window until the other day, now it’s outside. I also have a new one I just planted. I need to put them in bigger pots, they are in milk jugs right now. That’s crazy your dog keeps pulling them up – they’re kind of prickly. I can’t wait to see how they do for you. That’s funny because my dogs did that too! I ended up having to put it up high and it finally rooted. You said it will turn a golden color when ripe. Do I cut it just below the fruit and leave the stem? Yes, just cut below the fruit and leave the stem. Thanks, Patty. It is kind of fun, it’s definitely the thing we’re most excited about. That is so cool! I’ve heard you could do this but never known anyone who tried it. I’ve thought about trying it but here in Ohio I’m thinking even if I keep it in the house it might be too cold in the winter. I’m trying something similar with celery. It has only been a few weeks since I put the stub in water but roots have sprouted and several leaves are growing up and out. We’ll see if we actually get any celery stalks. My garden has been many many years of thinking and wishing so we are looking forward to our second raspberry harvest but because I’ve had very little actual success I always enjoy seeing everything you have in your garden! ohhh, raspberries will be nice. There’s a great book called Growing Tasty Tropical Plants written by a couple in NY. They grow all this great stuff in pots indoors. You might check it out. 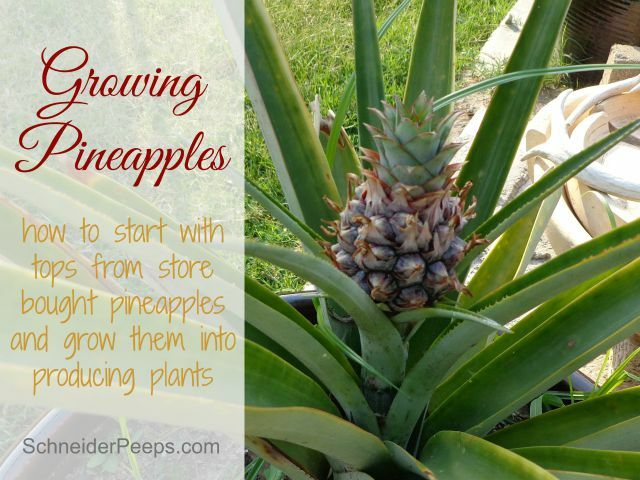 I think I may have to add pineapple to my garden this year – I didn’t even think of it! 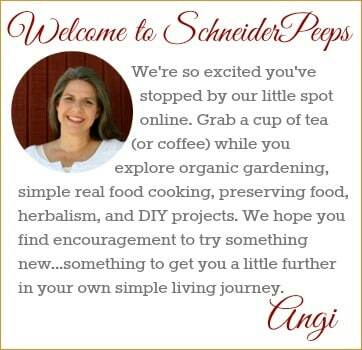 Thanks for linking up with us at Natural Living Monday! I have one growing in my yard, I can not wait till it produces. Is it 2 years before they produce? yeah, 2 years. But it really does go buy quickly. Let me know when yours produces and I’ll celebrate with you! We have three coming up right now. We planted the tops from the ones we got at the grocery. We’ll be eating well this summer! Thanks for featuring this easy plant. Yours are definitely farther along than mine. I remember seeing a pic on one of your posts a few months ago and asking you about them. I thought mine would never produce and here it is. Do you know about how long it takes the fruit to grow and ripen? That is amazing! I love growing things out of what others may deems as garbage! Thanks for sharing. I am pinning! Me,too. Thanks for visiting…and pinning. How cool is that? They really are pretty hardy. I was at Trader Joe’s yesterday, and they had pineapple plants with pineapples on them for $12! I was thinking that I may buy a couple of those, and then plant our tops when we finish pineapples…eventually we will never have to buy pineapple! YAY! wow! I’ve never seen pineapple plants for sale that acutally had a pineapple on them. I’d buy a couple if I did. Never having to buy pineapples again is my long term goal,too. Home Depot in Victoria actually have the pineapple plants with baby pineapples on them for sell right now. I grow my own from grocery store pineapples too. Oh, that is good to know! I have several growing but our rooster decided to try one of them. I’ll have to check that out. Don’t cut the top off the pineapple, Just twist the leaf crow from the base and it pops out like a cork. This is the part I root in water, then plant. I haven’t had any rot on me, but I trim the lower leaves close. Great post! At one point I had over 35 plants. I think we are down to 20 now as I gave the others away. It gets cold enough here that they have to go into the greenhouse. Just a few of my tips. *Once the plant produces a pineapple, it will produce a new main shoot and “pups”. The new shoot will produce another pineapple in about a year. The pups can be broken off or cut off and planted in pots for additional plants. Thanks for the tips and for sharing your post! Oh my goodness!! This is so cool! I live in Montana so this would very likely not be an option for me, but I have never even thought about anyone growing a pineapple at their home! You have broadened my horizons today. Thank you! So cool! Ha! I’m so glad I broadened your horizons! It really is pretty cool see it grow, very different than most fruits. There is a book called Growing Tasty Tropical Plants (http://amzn.to/1UpKx8D) and they live in NY and grow all kinds of stuff in pots. A pineapple will grow great in a pot and you could just bring it in and put it near the fire in the winter. I have one growing that is 2 or 3 years old.It was at a stand still until I read somewhere about a week ago to water it down the center of the plant. I did so and my plant has really started to grow.. I bring it inside during the winter.. It is close to 100 degrees and it is looking good. 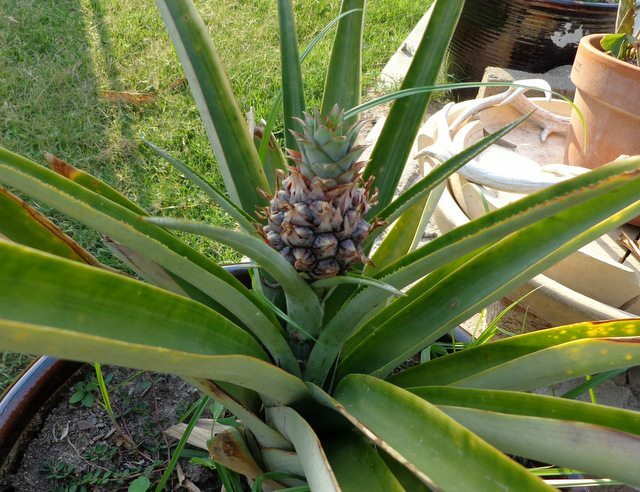 I am anxious to get a pineapple that I grew myself. I have been trying for about 20 years but I think this time I will succeed ! That is so exciting, Joyce! I’ll have to pay attention to how I water mine, that’s a good tip. Let me know when you get that first pineapple and I’ll celebrate with you! I have been growing a pineapple indoors. It is now 5 years old and still no fruit or any indication of a flower. Blades are 4 ft long. Plant looks hardy, but no fruit! What’s wrong? hmmm, I wonder if it needs direct sunlight to fruit. Can you put it outside this spring? I’ve never grown them indoors so that’s my best guess. Very helpful post! I have one growing in my garden that is very hardy but has long, skinny, yellowish leaves instead of fat, green ones. Is there something wrong with it? Hi Rachel, I wonder if it’s getting too much water? Pineapples tend to like the soil a little on the drier side. If it’s too dry, the leaves will turn light green, then yellow and then red. If they are just yellow, it makes me think they’re getting too much water. Hope that helps.